AFP Consulting, LLC - Jock Tax Professionals | Is Tennessee's Version of the "Jock Tax" Unconstitutional? Authors Alan Pogroszewski and Kari Smoker examined this very question in their recent law review article and conclude that it is. In July of 2009 the state of Tennessee imposed a Professional Privilege tax on athletes performing services in the NBA and NHL. Those athletes are assessed a $2,500 tax for each game they play, up to a maximum of three games in the state of Tennessee. 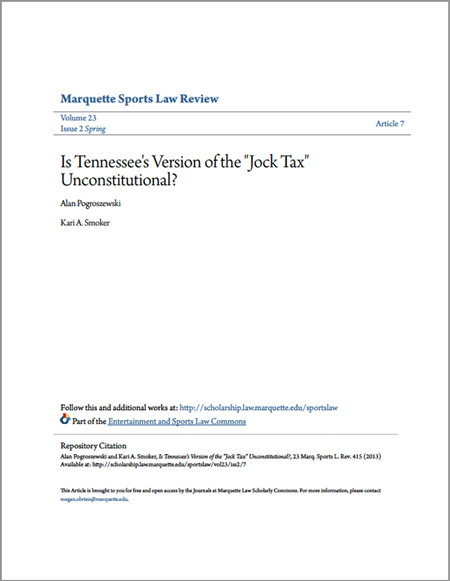 In our article “Is Tennessee’s Version of the ‘Jock Tax’ Unconstitutional?” we examine the constitutionality of this tax by using the framework established by the US Supreme Court both the Due Process Clause and the Commerce Clause. We revisit the Supreme Court’s 1977 landmark case, Complete Auto Transit, as well as subsequent case law and conclude that Tennessee’s Professional Privilege Tax, as applied to professional athletes in the NHL and NBA, fails Commerce Clause scrutiny because the tax is not fairly apportioned, it discriminates against interstate commerce, and it is not fairly related to the services provided by the state of Tennessee.